n a few minutes we are going to tell you about an often overlooked way to grow significant wealth in 10 years or less right here in Trinidad. But before we do we want to show you the math to prove this approach will work with almost any income. Doesn’t matter if you’re making $10,000 or $40,000 a month. Yet only a handful of Trinis will make the commitment because as simple as this wealth strategy is you need to stay focused for it to work and not get distracted by people who claim it's not practical. With decades of experience in banking and finance we know better. Let’s start by looking at the numbers so you see there’s no gimmick, no financial mumbo jumbo—just pure math. The lady makes $16,000 a month after tax and her husband is a teacher who brings home $10,000 after tax. Their combined household income is $26,000 a month. But the important number here as you will soon realise is how much of this $26,000 this couple is able to save every month. After expenses they save $2,600 a month or 10 percent of their income but at this point this couple can forget about creating significant wealth for themselves and their family any time soon. Because by saving just 10 percent of their income they’ve automatically made the choice to delay financial independence and remain in jobs for a long time. In fact, based on their expenses, they would need to keep working for more than 40 years before they could afford to retire and by that time because of inflation the money won’t have anywhere near the purchasing power it does today. But what if they decided instead to cut their expenses and supersize their savings to something like 30- 40- 50 percent of their income? Assuming a return of 3 percent (we’ll explain this 3 percent later) if they saved 50 percent of their income each month ($13,000) they would have $1,788,365 after 10 years thanks to compound interest. Now we realise this leaves them with just $13,000 a month to survive on and you’re probably thinking at this point you should just stop reading this article because there’s no way anybody could live on so little let alone save that much. Frugal living is by no means impossible. Sure, it may be hard for some people depending on their lifestyle choices but it’s not impossible. Being frugal is just another way of saying live below your means. It’s a strategy we wholeheartedly endorse because we believe in the power of saving to achieve financial independence and not have to work a day longer than necessary. Google “FIRE retirement” (It stands for financial independence, retire early) and see how many people build their fortunes through powerful saving. By hitting reset on the things you value and living well below your means you could eventually hit a saving rate of 50 percent or more of your monthly income. Not the 10 percent savings you keep hearing about. Not the 40 years they tell you you have to spend working for the man. You won’t see this on Facebook so you will have to take our word for it: There is a growing number of Trinis who are quietly accumulating small fortunes for themselves by living on just 50 percent of their income. Your saving rate is ultimately more important than investment returns. In other words, discipline with your money matters more than picking the right stocks. Save nothing, you will chase financial freedom forever. Listen to those banks who tell you to put aside just 10-15 percent in savings and real wealth will elude you for decades. But where it starts to get really interesting is when you make the bold step to cut your expenses, embrace frugality and save 50 percent or more of every dollar you earn. And you want to know the best part? Because while you can’t control how the stock market or the economy performs, while you can’t predict if and when you will get a raise, you decide how much you can live on. Staying with the couple in our example above, if they saved just $7,270 a month, they could amass a million dollars in 10 years after compounding. That pretty much settles the argument because if they really wanted to so many couples could save $7,270 a month. Many of you who are blessed with high-paying jobs could save that on your own just by making the decision to cut expenses and increase your saving rate over time to 50 percent or more. And that’s how much you spend. Yes, it will take self-discipline to cut back in this iPhone culture. And if you consider yourself middle class you might tell yourself this whole business of living frugally isn’t for you. If you’re willing to break free from what it means to be middle class in the first place. The naysayers will want you to believe having an impressive net worth is impossible because they look around and see most people living paycheck to paycheck, struggling to even come up with a 10 percent down payment for a house. But if freedom is what you truly desire and you decide to make saving a priority then it’s more than possible. In reality, most of us have a spending problem. And it's prevalent in the middle class where after years of hard work too many people have nothing to show for it. “Radical” only because the existing culture demands that you spend, spend, spend just so you can fit in. Yet it’s guaranteed to work because regardless of the excuses you make, you are in full control of your spending. That’s not true for other paths to wealth like business or real estate which both have high failure rates and where so many variables lie outside your control. It really comes down to the choices you make based on what’s important to you. Building significant wealth in the short term might mean taking a maxi and a couple taxis to get to work instead of throwing money behind a car payment. If you’re one of those couples who found ways to justify a second vehicle. On depreciating assets like cars. 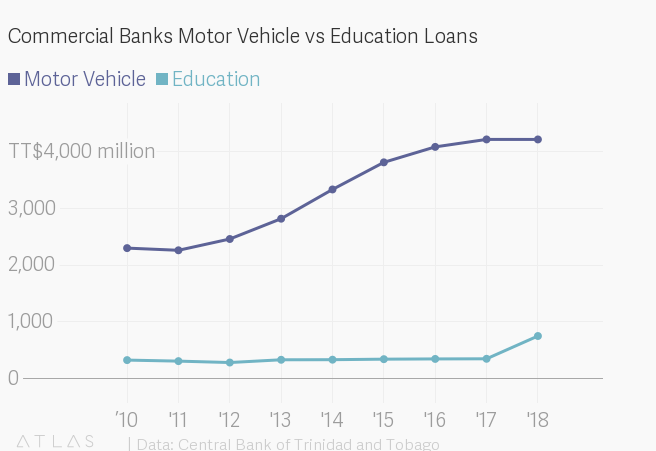 According to data from the Central Bank, car loans from commercial banks have nearly doubled in the last ten years, up from $2.3 billion in March 2010 to $4.2 billion at the end of March 2018. Now don’t get us wrong, there are legitimate reasons to own a vehicle like work and personal security. But too many of us have made the car the status symbol of choice for flimsy reasons. We could care less about our net worth if the SUV has keyless entry and a sunroof. The car is what we value above everything else and the banks would have it no other way. 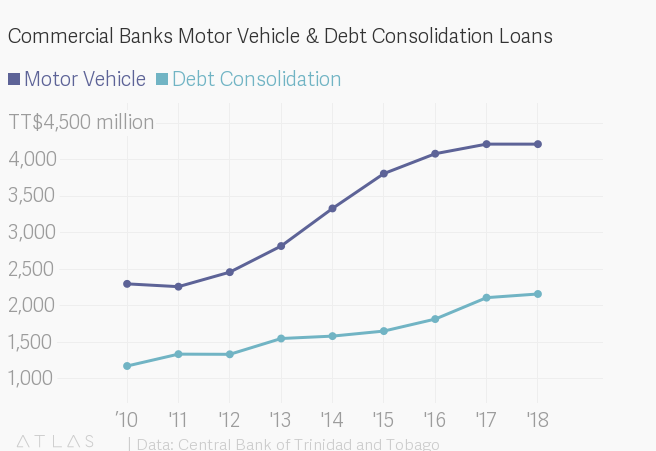 Besides the spike in car loans, Central Bank data also shows a marked increase in debt consolidation loans. It doesn’t take a finance major to figure out this is likely because we get ourselves into so much financial difficulty taking on unnecessary debt we’re forced to run back to the same banks for help. That’s not a smart way to live. Certainly not smarter than frugal living which lets you build wealth. Starting now, you must live different from how your friends live so that in 10 years you can do something none of your friends ever did. Like skipping the mortgage and paying cash for your home. Or owning rental property outright. Or sending your children to a good college. Hop over to this compound interest calculator and do the math yourself. Save $7,270 a month and in 10 years you will have a million dollars cash after compound interest at 3 percent. Increase your monthly commitment to $9,100 and that jumps to $1,251,856 after 10 years. That’s more than enough for your emergency fund and you’d also be on track for early retirement. That’s the real genius of this approach to financial independence. It’s not just that anyone can cut their expenses, save money and build wealth. There is the wealth you build by committing to a high saving rate (50 percent is the magic number) and there’s the interest income you earn on that savings as a result of compounding. The $1,788,365 they earn after 10 years saving half of their after-tax income of $26,000 includes $228,365 in interest income, which is money they earn on top of their savings. Assuming they are young and have some years ahead of them, their earnings would jump to $2,436,375 including $408,375 in interest income simply by maintaining a 50 percent saving rate over 13 years instead of ten. To generate that kind of interest income you need to find a safe place to park your savings where the interest rates are significantly higher than the bank. Right now that’s a Development Finance fixed deposit. Hands down, it’s the highest paying fixed deposit in the country with a guaranteed rate of return of 3 percent for 1 year up to 3.75 percent for 5 years. In terms of the interest you can earn, DFL fixed deposits outperform all regular savings accounts and most money market mutual funds. Plus our experience shows (and research backs us up) that you save more long term when you restrict access to your own money. A regular savings account at a bank doesn’t restrict access. Besides paying you next to nothing in interest and charging high fees, banks sell you the idea of easy access to your savings via LINX cards and ATMs. But what they don’t tell you is this convenience comes at a cost because that’s how you wind up spending the money. DFL fixed deposits offer a more sensible approach. They let you lock down your savings and guarantee a high return if you don’t touch your money before the term is up. And they aren’t volatile like the stock market or money market mutual funds which could be up today and down 30 percent in three months. On top of that, your deposit is covered by deposit insurance up to TT$125,000 so you don’t have to worry about losing a penny. Some readers are probably asking at this point whether they’d get more interest income buying government bonds. To which we’d say sure, sometimes bonds pay a little more but that’s on whatever cash you have on hand to buy the bonds at the time of the offer. You have to remember bonds have a deadline date. There is an offer and a few weeks later the bond offer closes. If you miss the chance to buy you’re out. Besides, most bonds are out of the reach of regular folk because they are only offered to institutional investors (NIF was notably different). And if you buy bonds they’re not as easy to resell if you want to cash out. A fixed deposit doesn’t work like that. There is no deadline. You can open one with DFL anytime as long as you have a minimum of $10,000. In fact, most people don’t realise they can open multiple fixed deposits as single or joint accounts if they’re saving money a small amount at a time. You can even structure all your deposits so they mature at different times through a process known as laddering. That makes them perfect for long-term saving where your ultimate goal is wealth creation. DFL is the only Central Bank-licensed financial institution offering an annual return of 3 to 3.75 percent. Work your way to a saving rate of 50 percent of your income and you will have a nice chunk of money in a few short years. All you need to do to get started is click the OPEN MY DEPOSIT button below. Start with any amount over $10,000 if you’re just getting started or a larger amount if you’ve been saving for a while or came into some money. Not some obscure “investment strategy” some people want to sell you. Those banks will keep in you debt with offers dressed up as “100% Financing” because they make a killing off the middle class. We want you to get out of debt so you can save half of your income. So click that button now and start building the future you deserve.